I love Land's End. The have such great quality products. I would love to win the Lighthouse Wheeled Duffel Bag. Thanks so much for the chance. I follow your blog. I love to read it!! I think the kid's slipper are so cute. I'm cracking up over the penguins. 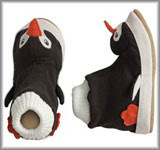 I'd probably have to go for the kid's penguin slippers in size 11 (for my 5 year old). I love the wheeled duffle. I travel alot and this would be perfect. I like the Kelly Green color. The wheeled duffel bag in bright red for me please! wow! what a great giveaway. I'd love to win the Lighthouse Wheeled Duffel Bag in Dusk Black. I would love the duffle bag in bright red. That way it's easy to find at the airport! Thanks for the great giveaway. Out of the choices, I would like the Lighthouse Wheeled Duffel in Black! My top choice would be the wheeled duffle bag in kelly green; my second choice would be the women's slippers in charcoal heather. i'd like to win the duffel bag in dusk black! hmm..my first choice would be the kids slippers...the penguin ones are my favorite!! The dogs are ok..but the peguins are adorable! Thanks for the chance! I'd love the Lighthouse Wheeled Duffel bag in Coral Pink. My bag is in a very sad state! I'd pick the penguin slippers size 9 for my little boy. Too cute! I would love to win the Lighthouse Wheeled Duffel Bag in black. I recently had spinal surgery and this could really help me with long travel. Thanks for the giveaway! Oh boy could I use the wheeled duffle bag!! I'd LOVE to have a Kelly Green one!!! Would put it to good use when we travel for spring break!! Lands End is really nice, and I'm not just saying that because there is one located near me :) I'd go with the Duffel Bag, which looks really nice. And I'd definatly go with the Coral Pink since Pink is my favorite colour. Thanks for entering me! love LE stuff! i would love the Lighthouse Wheeled Duffel Bags in red. I would like the travel slippers in Charcoal Heather in size 7. I really like the luggage wheeled set in pink corral and the spice brown tote. my favorite is the swing fleeced coat in black..
Love the Lighthouse Wheeled Duffel Bags in Dusk Black. 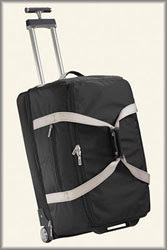 The wheeled duffel bag in light sapphire is great! I'd love to win the women's slippers in charcoal. I would love the duffle bag in bright red. I'd love to win the duffle bag in red!! I would love the wheeled travel duffel in red. 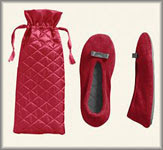 I would really like to win the women's travel slippers! I'd love the women's slippers in Charcoal!! I'd love the duffel bag in either bright red or dusk black! My son would love to have the Penguin slippers. So cute! I would love to have the penguin slippers for my 4 yr old dd :D She loves all things "wintery" and she LOVES shoes & slippers! Thank you so much for the chance to win! :) I now follow your blog! What an incredible giveaway! Those slippers are super cute (especially the purple snowflake ones) but I'd choose that rolling duffel in black! I need some slippers!! Those are so cute, too! I LOVE the lighthouse wheeled duffel bag in light saffire! What a great giveaway! My kids would love the fleece slippers. I like the blue snowflakes - gender neutral in case there's a little brawl over who gets to wear them. I subscribe via google reader. I love the Lands End Duffel Bag in Dusk Black. Thanks for the great opportunity. Lands End is so awesome. I would love to win the duffel bag in black. My husband travels a lot and his suitcase broke. LE products are always top quality. Thanks for this giveaway! My son would love the dog slippers in a size 11. Those look so warm and cozy-thanks! I would like to be entered for the Lighthouse Wheeled Duffel. Thanks for the reviews. I would love the women's slippers in a 9. Love Land's End - especially their swimsuits, as much as you can love swimsuits :) I would choose the Lighthouse bag in bright red. I'm following you now on Twitter too. Thanks!! I'd love to win the duffel bag in black. Thanks for the giveaway! I suscribed by email. Thanks! I'd get the Lighthouse Wheeled Duffel Bags in bright red. I would love the duffel bag in pink coral. Thanks! I would pick the slippers in English Lavender. Lands End has so many great products and I was glad to hear they are great to work for as well. I could use some new slippers, so I'd love the women's slippers in English Lavender! Thank you for the giveaway! I would love to win the Lighthouse Wheeled Duffel in the coral pink. The color is so purty and then DH will never steal it, LOL! I would love to win the Lighthouse Wheeled Duffle bag. I would prefer the Dusk Black color. I love the Lighthouse Wheeled Duffel Bag in Kelly Green. Great giveaway - thanks! I'd love the Lighthouse Wheeled Duffel Bag in any color, thanks! I would love the Lighthouse Duffel in Bright Red. I really need some new luggage and this would be perfect! I would like the duffel Bag in pink coral. I'd love the Lands End Wheeled Duffle in Pink Coral. My daughter needs a camp duffle after leaving her stinky wet shoes and towels in the old one for a week at camp last summer.